Take away some of the "too much" ... in life and in yoga! The more I practice and teach yoga, the more I appreciate a well balanced sequence that includes low range of motion postures. Strength and stability have become as important as flexibility to me and I'm seeing and feeling the difference. We spend a lot of time folding forward in yoga (and in life) so it's important that we balance that out by strengthening the back body which will lengthen and open the front body. 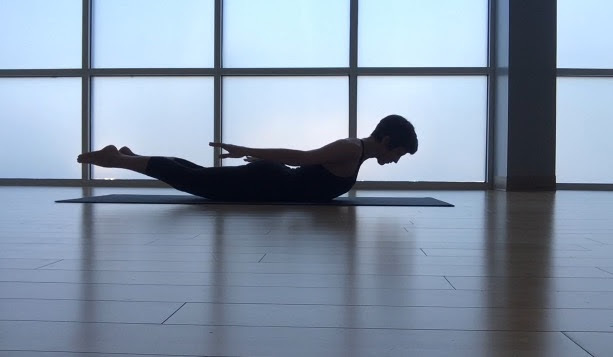 One way to do that in a vinyasa flow class is to include more prone backbends. Hello, locust pose (salabhasana)! I like to engage the back body early in a practice to awaken the idea that there is much more to us (and our practice) than what we see in the mirror (the front body). There are many ways to strengthen the muscles on the back of our body, but if vinyasa yoga is your main practice then we need a holistic asana practice that engages us fully and counters that human cashew posture that modern life folds us into. Locust is an accessible yoga posture that does all those things - it strengthens the muscles of the back body (posterior chain) and it lengthens and opens the front body. Remember, it doesn't have to hit you over the head to be effective! Lie on your belly, forearms stacked in front of you making a place to rest your forehead. Let the legs rest easy at the wide edges of your mat. Cultivate the breath focusing on the belly and diaphragm. Crocodile pose is a nourishing, restorative pose that is also a passive, non ambitious back bend. It puts the spine into the tiniest amount of extension which makes it a great warm-up for other prone backbends like locust. From crocodile pose sweep your arms back alongside the body. Inhale and rise. Lift your chest and legs. Remain long, reaching out through crown of the head. Repeat 2-3 times. Try other variations like reaching your arms out to your side, out in front of you and interlacing them behind you to further open the chest. The back body holds the spine. It's main purpose, to provide support. When we do movements like locust pose, we help awaken the inherent strength of the back so our body can do its job of supporting our frame through all the other amazing movement and asana that we do.